I’m excited to be able to share another story today as part of my new partner blog series. In my last post, ‘Optimising Predictive Maintenance Income Streams with AI’, I had the opportunity to talk about our partner, Valuable Data, who is focused on addressing manufacturing clients’ industry challenges. Today, I am thrilled to share some insights into how our partner Viteco is working with Yellowfin and Exasol to deliver BI projects at lightning speed. I felt this post was pretty timely, firstly because we have seen so many organisations get little value from their BI initiatives and often spend anywhere up to 18 months delivering a project. The process of defining the business case, deciding on the tools, finding the resources to deliver it, understanding the data and reports required, and then reviewing whether or not the database or data warehouse is scalable, is lengthy and complex. Secondly, I wanted to talk about Viteco because they’ll be at Exasol’s flagship event Xperience, which is taking place in Berlin this week. For those of you who don’t know, Yellowfin has a special relationship with Exasol, and it’s fantastic to see how partners like Viteco have maximised this opportunity to combine a structured methodology with a reference architecture to deliver faster, more successful BI projects. Viteco is a Danish technology firm based in Copenhagen that has been around for almost 10 years and began partnering with Yellowfin about five years ago. They are an end-to-end BI technology and solution provider with significant skills in ETL, programming, and data warehousing. It’s with this breadth of experience that they developed the Viteco Data Suite, which is a set of “Data Warehouse Automation” tools, and provided the foundation and competitive edge for their BI projects. Interestingly, the technology partnership for Viteco wasn’t client-driven to start with. Exasol came highly recommended and Viteco immediately saw how they could combine the use of their automation tools to deliver a very fast extract of data, push it straight into Exasol, and report on it straight away with Yellowfin. By reprogramming their Data Suite to work with Talend, they could go beyond Microsoft SQL and start to deliver solutions using Exasol. Exasol is an innovative in-memory analytic database technology, ranked the world’s fastest database by TPC-H, the independent industry benchmark for evaluating performance. 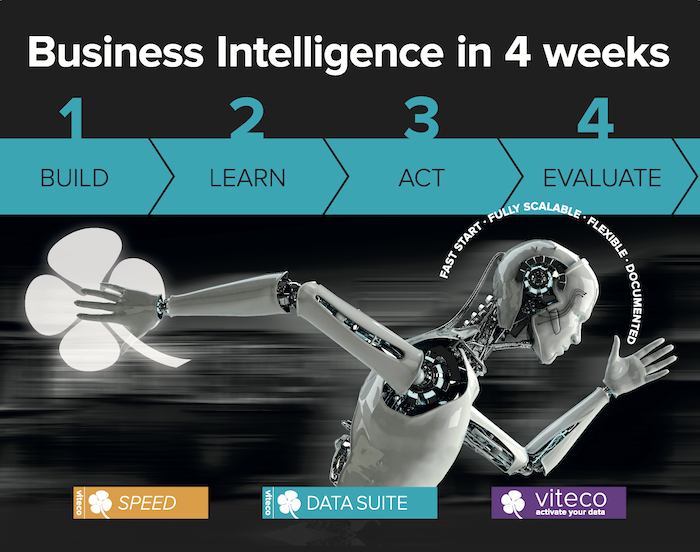 SPEED is Viteco’s approach to delivering fast BI Projects. It is a fixed price package that aims to deliver a minimum viable product (MVP). Using this approach, Viteco work with clients to extract data from their business applications, load the data to Exasol, and run a workshop to define the reporting requirements before building a set of reports in Yellowfin. With Yellowfin, Viteco have found that you can report at a much earlier stage and do the ETL programming afterward, if it’s even necessary. The turnaround time for projects using their Data Suite tools and SPEED methodology is approximately four weeks, which is truly impressive. SPEED was initially created because BI implementations were slow to deliver. But talking to Peter, it’s clear that there are many benefits of working in this way. One of many benefits is that clients can tighten up the cost and time spent on gathering initial requirements. If they want to use another partner or deliver the project themselves, they can benefit from the information that is gathered up front and the structured approach to mapping out requirements. One customer, Blue Energy, has seen significant performance improvements by moving to a solution based on Exasol and Yellowfin. In a January press release, the COO and partner at Blue Energy A/S, Christopher Olesen, stated that it took them only one month before they could start reporting and analyzing the relationships in vast amounts of data, giving them much greater transparency. Another customer has seen results in less than a week simply because Exasol is so fast. Preliminary data models can be based on SQL views in Exasol, instead of dimensional models and fact tables. Yellowfin plugs in super easily to show early results, which meant this customer managed to get 20 reports and five dashboards created within a week. The best thing about this approach is that it’s an off-the-shelf solution but it’s still highly flexible. Viteco has a proven methodology that is focused on business requirements, using proven products, that enable them to stand up a solution in no time. The whole team at Viteco love making BI simple and that’s what I like most about this partnership. If you’d like to know more about this, just send me or Peter a message. We’d both be delighted to meet up with you at Xperience.